Highlight your love of rural living by adding this Bird In Hand Red Warwick Woodcutter's Cottage Bird House to your garden. This remarkable avian shelter is sure to bring a rustic look to any setting, thanks to its reclaimed wood construction and familiar, barn inspired shape. The tall, wooden body provides your feathered friends plenty of nesting area, while a pitched roof protects the interior from the elements. The deep red hue on the body enhances the barn motif, and white wooden slats on the front evoke a door. An additional, sloped roof against one side of the building continues this fun theme, and a few twigs here mimic firewood. A 1.25" diameter entry hole sits above the door frame, and the overhang of the roof directs rain away from the interior. Ventilation gaps on two sides of the shelter help regulate the internal temperature, and holes on the generous, bottom platform provide drainage. A 2" diameter opening on the back of the piece assists in seasonal cleaning, and remains covered by a metal square to further protect the birds. Attach a mounting plate (not included) to the base of the home to post or pole mount it, or hang it from a bracket with its attached eyehook. Its reclaimed wood body reduces waste and brings environmental awareness to your garden, while creating a weathered look on the adornment. 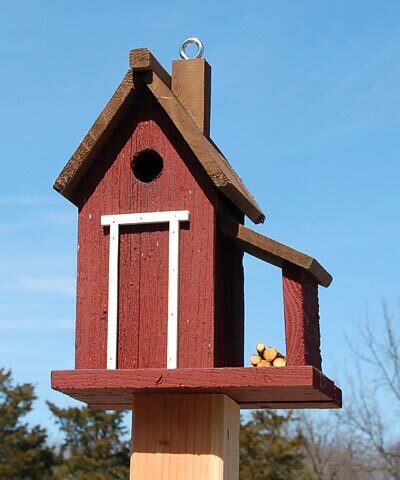 Offer birds a familiar shelter by adding this Red Warwick Woodcutter's Cottage Bird House to your backyard. Made in the USA. Circa Modern Plant Hook, Chrome, 12"